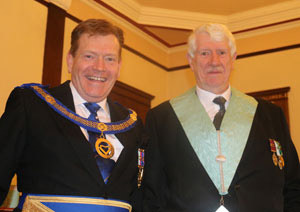 Despite the cold night and parking problems, Warrington’s large lodge room was filled two deep to see Norman Pritchard be installed into the chair of Academy Lodge No 9382; a total of 105 Masons. Kevin (left) and Norman before the ceremony. Sitting in the chair of King Solomon for this last year has been Ken Croft, one of the few remaining founders of the lodge and a fitting appointment for the 25th anniversary. There literally wasn’t a spare seat. Notable among the brethren were a good number of light blues. Principal guest for the evening, Assistant Provincial Grand Master Kevin Poynton, was admitted with due ceremony, accompanied by grand officers Dennis Rudd, Gordon Amos, Derek Hunt and Chris Eyres. They were supported by acting Provincial grand officers Les Savage, Fred Dickenson, Trevor Jones, Howard Savage and group chairman Andy Barton. There was an easy atmosphere in the lodge room throughout the ceremony, witnessed by a varied mix of Masons from locations all over the north of England; testimony to Norman’s popularity. He was presented for installation by Peter Walker and Peter Whalley. The installing master for the evening was Colin Boardman (incidentally, the first joining member of Academy Lodge), the installing senior warden was Alan Dixon, the installing junior warden was Alan Inge and the installing inner guard was John Thompson. The third degree working tools were presented by John Wright (a junior brother), the second degree working tools by Darren Poole while the first degree working tools were given by Graham Greenall (all three light blues and all doing a good job). In addition, there was that comparative rarity, the master’s tools, delivered eloquently by Jerry Lawes from the Eccles group. Kevin and Norman with a host of light blues. Addresses were given to the WM by Arthur Hamblett; to the wardens by John Walsh; to the DC by Les Savage and to the brethren of the lodge by Kevin Poynton. A surprising number of addresses (and the wardens’ columns) were delivered by the WM himself as he presented the collars of office. Norman presented Kevin with an envelope for charitable donations for the sums of; £350 to Zoe’s Place (a charity for providing palliative, respite and end of life care to babies and infants), £150 to Warrington Masonic Hall and £600 to the Masonic Charitable Foundation 2021 Festival – a total of £1,100. Unfortunately, on opening the envelope, Kevin only found two of the cheques, the third not having been written out. After a suitable amount of leg-pulling by Kevin, an IOU was hastily produced and I can now reveal, the last cheque has been written out and forwarded. After the meal, Kevin gave a speech emphasising: that the Grand Master will this year be achieving 51 years in office; the duty of more experienced brethren to pass on the benefits of Freemasonry to the less experienced; he gave personal thanks to the acting officers who had attended him at the meeting and gave a special thanks to Norman for the huge amount of effort he puts into his Freemasonry. 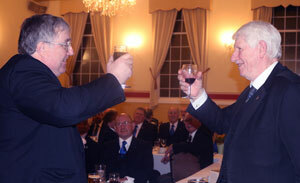 Peter Whalley (left) toasts Norman during the Master’s Song. In addition, Kevin made a point of celebrating the work of John Walkey, as DC, Peter Blease as organist and Eric Miller as reporter. Finally, he celebrated the work of those who had been appointed or promoted to honours in Craft and Royal Arch. For a change, the masters song was not excellently sung by Norman Pritchard, as he could hardly sing it to himself, but was instead delivered by Peter Whalley and very finely sung it was too. But prior to this, as a personal tribute, Peter sang ‘Bless this lodge’ with a most poignant delivery. The songs were well accompanied by Peter Blease, who also gave the gift of music in the lodge. At the end of the night, the lodge routinely celebrates the founders of the lodge in a toast and this time they made a special point of celebrating the four remaining founders (three of whom were present) and particularly Eric Kehoe, who came out of retirement to be secretary. Eric responded in his usual, humble way. He is a true example amongst Masons. It was a late night, well spent. Pictured from left to right, are: Dennis Rudd, Rob Williams, Howard Savage, Colin Boardman, Gordon Amos, Derek Hunt, Kevin Poynton, Norman Pritchard, Andy Barton, Les Savage, Fred Dickenson, Trevor Jones and Ken Croft.